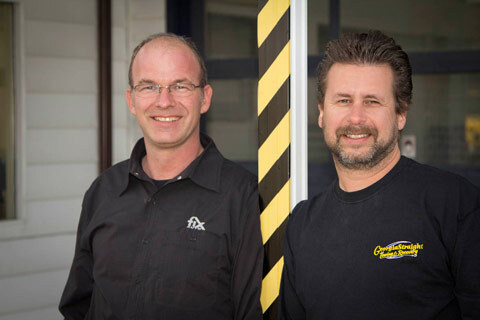 Jason Borth & Wayne Woodbeck purchased the business in 2013. Having been a part of the Comox Valley for many years, both they along with their families dedicate a great deal of time, effort and money to local charitites and events in our local community. In the past two years they have raised the bar in the towing industry, by public awareness, and both internal and external training certification of operators on safety and awareness. Showing dedication by participating and voicing opinions with industry organizations, ensuring the company is going forward. Our focus is to provide a safe work environment for our employees while providing quality services to our customers. We pride ourselves on our level of caring for all our clients needs, from locking your keys inside your vehicle, running out of fuel, flat tire to dead batteries or vehicle recovery, Georgia Straight Towing and Recovery is only ever a phone call away. We are available 24 hours a day 7 days a week with a friendy dispatch service ready to assist you. We are committed with efficient safe service, to suite your needs with one of our many fleet vehicles and one of our 7 dedicated WreckMaster Trained employees. Georgia Straight Towing and Recovery is the only towing company in the Comox Valley authorized by BCAA. Georgia Straight Towing began operation in 1984 inspired by Bill and Elsie Wright's desire to provide an important towing and recovery service. Their modo - "professional, quick and affordable". Through the years to present day, Georgia Straight Towing and recovery has maintained that very same degree of business standards. We can tow, or make towing arrangements for almost anything! CALL US (250) 338-9899 We're Tow-iffic!! Georgia Straight Towing & Recovery.